Etta James and Whitney Houston are gone, but Bonnie Raitt is back, and that’s something to be thankful for. “I’m not getting older, I’m getting better” might be an idle boast for some. But Raitt’s voice, like that of the ageless Tony Bennett, has gotten even better with more miles on it, still sounding like the sonic equivalent of a glass of Southern Comfort. And when it comes to selling a lyric, there’s no one better in any genre. 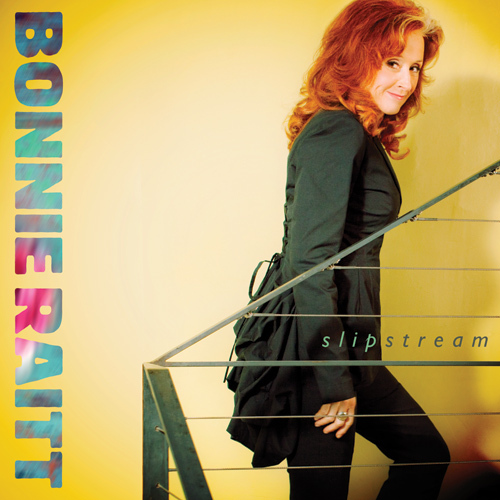 Let’s cut to the chase: Slipstream is Bonnie Raitt’s best album in years and one of the best of her 40-year career. That career has had major triumphs (Luck Of The Draw has sold nearly 8 million copies) and major troughs. Warner Brothers, with a patience and loyalty unknown in today’s music world, released six Raitt albums before she finally scored a hit single. Her big breakthrough, however, came in 1989, 18 years into her recording career, when she teamed up with Don Was to make Nick Of Time, winning three Grammys and soaring to number one. The cream always rises. The first release on her own label, Redwing Records, Slipstream is like two albums in one: four songs produced by the idiosyncratic country blues/Americana artist Joe Henry, who has guided highly acclaimed sets by Allen Toussaint and Solomon Burke; and eight songs produced by Raitt herself. All four here are wonderful: the Henry ballads “You Can’t Fail Me Now” (co-written with Loudon Wainwright III) and “God Only Knows,” and two songs from Bob Dylan’s Time Out of Mind, “Million Miles” and “Standing In The Doorway.” The decision to cover Dylan’s slow blues was inspired – they fit Raitt’s world-weary voice as well as they fit Bob’s. The self-produced tracks are every bit as good. After years of working with masters like Don Was and Mitchell Froom, Raitt has clearly learned what works for her. She makes great use of her scrupulously funky, longtime touring band: George Marinelli (guitar), James “Hutch” Hutchinson (bass), and Ricky Fataar (drums), plus a superb Mike Finnigan on keys. And she has an unerring instinct for picking songs that she can make her own. The album’s first single, a reggae version of Gerry Rafferty’s “Right Down The Line,” works like crazy; it could have been written expressly for her. And her treatment of Dylan’s “Million Miles” deserves special mention: Raitt’s vocal and slide guitar performance transforms the song into a modern blues classic. When she sings “Rock me for a couple of months/You know, honey, I’ll rock you, too” she makes you believe every word. This is a scary blues, with ominous low-end piano stabs, Frisell’s spooky accents, and Jay Bellerose’s brilliant broom-closet drumming; he sounds like someone rummaging around the house in the dark, while maintaining a dependable behind-the-beat authority. Of course, Raitt is also the reigning queen of break-up songs – after all, what could ever top “I Can’t Make You Love Me?” Those who have been waiting for a fitting sequel may finally have one here. Raitt summons the same heartbreak in her interpretation of “Not Cause I Wanted To,” a gem written by her pal Al Anderson (NRBQ and a million Nashville hits) and Bonnie Bishop. Like Etta and Whitney, Bonnie Raitt appears on Rolling Stone’s list of the “100 Greatest Singers Of All Time.” Slipstream demonstrates why she belongs there.